An e-commerce is the facility or service, which provide customers the service to buy products online on the Internet. Today In India and other countries e-commerce is being used for getting products online easier and faster. In the 21th century e-commerce comes with the new revolutionary concept-people can get their products online from many brands. Purchasing and selling of products has become very easier due to e-commerce. Communication from one seller to other seller provides different product and varieties in the market. One of the biggest challenges faced by the e-commerce industry is that most of the people are often unsure of their sizes and how their online purchase clothes will fit in real life. I’m trying to solve this problem by providing actual physical trial service for people trying to buy apparel online. This service helps customers to make purchasing decisions. Many people can get confused about their sizes or color choice and they prefer to buy products in the store. Trial Concept is a strategy of marketing which increases consumer satisfaction for online shopping. When consumer orders their product from the online site and gets size problem or other product visualization problem, this type of problem decreases the online sales because people do not want to buy again those stuff which comes with size problems. Trial Concept will make high demand in the market because it comes with the market demand calculation according to the trial demand. Basically, it will also help to consumer for getting their product to be available in the store. High demand of products in the market creates unavailability of products. Product quality and sizing problems will be solved by the trial option. In the future this feature will increase retail sales. The trial system will encourage people who have never shopped online before to try out online shopping by removing the restriction of size and fit confusion. In the 21th Century People more and more are shopping online. Studies have shown that e-commerce sales grew 15 percent in 2012, which is several times more than average retail industry’s spending growth. 80 percent of the sales in this industry are still taking place within the four walls. Even though a majority of apparel shoppers visit the retailer’s website, research the product online, or read reviews before making purchase, only a few actually buy the product online. Most people who do buy clothes online are likely to buy an item only after they have already tried it on in a store or seen someone else wear it before. This is especially true among women. Not knowing the quality of the product and having to wait for the product to arrive may affect the shoppers’ decision to buy clothes online, but the biggest problem I see preventing a shopper from buying clothes online is not being able to visualize how the product will look on her/him body. If the retailers can address this issue, the concerns like the quality of the product and the shipping time can easily be fixed. I agree that people want to feel, see, and try the product before they buy; and e-commerce sites can not provide that real experience of touching the product, but with improved technology and larger, better quality pictures, shoppers can get a pretty good idea of the quality. Plus the free shipping and free returns already being offered by many e-commerce retailers will give shoppers the option to experience the products without leaving their house. Retailers could not be able to solve fit issues on the Internet. Fit issues are the main reasons of customers that create do not feel excited about buying clothes online. E-commerce retailers can attract people if they can address their practical issues that are keeping many probable customers from shopping for clothes. Advanced digital technologies like the virtual fitting room software that provide the shopper better fit experience than the two dimensional pictures. But not every retailer can afford those expensive technology and not every shopper is willing to spend the time it takes for them to upload the picture (or whatever else is required to let the software know their body’s dimensions or size) and drag/select each product they want to try on and wait for the results. It is easier and time saving for the shopper to just clicks the size she/he wants to see on picture and get done. It may not give her/him the enhanced experience of three-dimensional virtual fitting, but it will give her/him a pretty good idea of how she/he can expect to look on those products. But a virtual fitting room is the lack of uniformity in apparel sizing. It is the biggest problem of the apparel industry right now. Each manufacturer has its own sizing standard. And, within each manufacturer, there are size variation depending on the fabric, style, and so many other factors. It is simply impossible for those software to accommodate all manufacturer’s sizing standards, which means majority of new and smaller brands can not be represented. To conclude, with help of general sizing guides posted by the retailers on their e-commerce site, the shopper may know what size of any particular item she/he should buy; but she/he can not visualize the product on her/him body if the model is not representative of her/him size. Fabrics behave differently depending on how they are woven, knitted, treated and finished. That means the product’s stretch ability; molding and yielding property varies depending on many factors. The same shirt can look totally different on women or men of different sizes. Women or men want to see if the product is going to fir or not. Therefore, many people prefer to try the item on their body before they buy it. The process of trial service includes all shops of specific brand. This trial feature distributes the goods from one place to other place according to the consumer demand or request when a consumer browses his/her product online. It will work faster compare to taking trial or finding shops of product. Trial service modifies the design of transportation for better service. When consumer rejects their product on the store, the retailer will sell the product; but in many situations consumers demand are different so trial service has to connect with all stores or warehouses. Cost factor for the transfer of goods matter a lot for the product cost. I am not sure that this idea will be accepted by every industry because many times it will not be possible to deliver every goods on the location, but my concept connects store to store. If consumer bought some product and he won’t be able to get this product within the deliver time, my service will deliver goods to the nearest the store. Consumers time will be saved by this feature: the consumer will get his/her product from the nearest store. Trial Concept clears many issues for the online shopping. Some times retailers complain that customers come in their shop for only trying clothes and retailers cannot charge for trying clothes in their shops so the idea of trial shopping solved the retailer’s problem. My concept for the online shopping related to customer satisfaction secures more online shopping. This idea will work with the official site of brands and chains. Users can easily go online and shop for items. If people want to see or check that product will fit or not, trial option works as a feature. This option takes four sizes and color of the product or consumer can order multiple choices at the one time but the multiple choice products will be limited. A consumer will be able to give five products for the trial at the one time. Some time retailers may not have stock all collection in the store so consumer faces problem for their choice product so the trial option will only provide the product available in the store. If consumer wants that product to get home delivered because at the trial time consumer wasn’t able to purchase that product, he can do so. Consumer will get only one-day time period for the trial and trial-purchase. Trial date and time will be sent by the customer care department to customers cell or email. Basically this idea gives opportunity to customer if he/she is not getting product on store in some areas. Communication of the one store to other store from the storage warehouse makes transfer of goods easier but the trial facility create some changes in the transfer of goods because suppose in one area there are two-three shops which do not have stock of high demand goods. 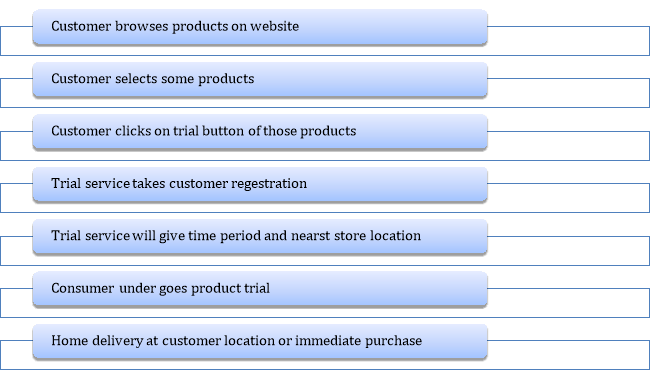 Trial system will calculate the product demand from the consumers according to the same product’s trial demand. So the trial system will help to the company for the area’s product demand. Example: in Lucknow, winter season is going on so people definitely buy cold clothes in the winter weather. If there are five shops of Tommy Hilfiger in the city and they have limited stock of sweaters. But the city people demand of Tommy products is high so the trial system will calculate the demand and provide stocks to these city shops. Trial system maintains the transportation cost because every week stores get their products from the warehouse anyway, so the trial will send by the warehouse. E-commerce platform has increased every year with new techniques of customer service. It’s necessary to catch consumer attraction for online shopping. In this competitive market every company should provide the latest techniques for high sales growth. The supply chain system should cover high demand or supply facility in minimum time. Customer survey for e-commerce can show that how online shopping can recover the unsatisfied customer with the newer services. Online issues related to payment, product specification, unavailability of the product, etc. create many unsatisfied customers. Trial service will be able to get more satisfaction and give advantage to online shoppers with regard to ordering high price products with the secure belief. "Innovation in E-commerce: Operation and Logistics." UKEssays.com. 11 2018. All Answers Ltd. 04 2019 <https://www.ukessays.com/essays/economics/innovation-ecommerce-operation-1390.php?vref=1>. "Innovation in E-commerce: Operation and Logistics." All Answers Ltd. ukessays.com, November 2018. Web. 20 April 2019. <https://www.ukessays.com/essays/economics/innovation-ecommerce-operation-1390.php?vref=1>. UKEssays. November 2018. Innovation in E-commerce: Operation and Logistics. [online]. Available from: https://www.ukessays.com/essays/economics/innovation-ecommerce-operation-1390.php?vref=1 [Accessed 20 April 2019]. UKEssays. Innovation in E-commerce: Operation and Logistics [Internet]. November 2018. [Accessed 20 April 2019]; Available from: https://www.ukessays.com/essays/economics/innovation-ecommerce-operation-1390.php?vref=1.